Dentists Directory Canada-DDC > Anusol, Aveeno, Band-Aid, Benadryl, Bengay, Benylin, Clean & Clear, Desitin, Fleet, Imodium, Johnson & Johnson, Johnson's, Lactaid, Listerine, Lubriderm, Motrin, Neutrogena, Nicoderm, Nicorette, Nizoral, Penaten, Pepcid, Polysporin, Reactine, RoC, Rogaine, Sinutab, Splenda, Sudafed, Tucks, Tylenol, Visine, Zantac > Johnson & Johnson Inc.
A lot has changed since those first surgical dressings. However, our commitment holds strong through our vision to enrich the health and wellness of every Canadian, every day. Around the world, Johnson & Johnson Family of Companies touch the lives of more than one billion people each and every day. And it’s not just through our products. We have a long tradition of community giving, corporate support, and environmental responsibility. Our employees also embrace this philanthropic spirit, generously donating time and money to the causes close to their hearts. In Canada we focus our philanthropic programs, sponsorships and donations primarily on women’s and children’s health and wellness. We also encourage employees to give to their favourite causes, matching personal donations they make, dollar-for-dollar. We first provided disaster relief in 1906 and today we still respond to hot spots in need of emergency aid due to natural or man-made disasters. We work with local organizations and international relief partners to provide over the counter medicines, personal care and wound care products. 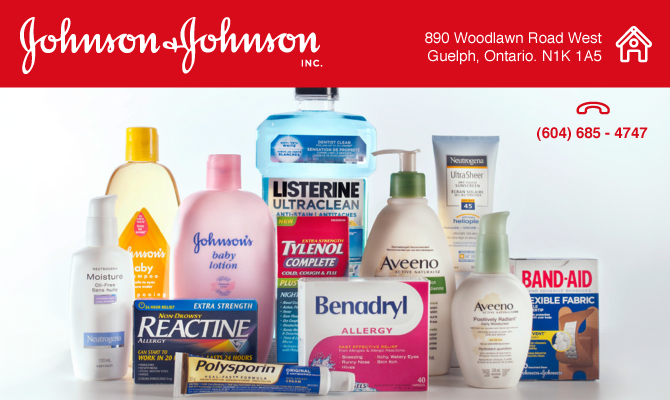 Johnson & Johnson Inc. is dedicated to helping others in need. We have established strong community partnerships in support of our mission to have a significant impact on the health and wellness of Canadians. Our goal is to build a strong connection between our employees, our company and our communities. We are currently not accepting unsolicited requests for financial donations, grants, funding, sponsorships, promotional items, and coupon or product donations. We wish you great success with your worthy cause. Healthy lives are dependent on a healthy planet. As voiced in Our Credo, our values are deeply rooted in the precepts of responsibility towards our customers, employees, community and world. We are committed to caring for a healthy future, and we have been for over 100 years. Every day, we touch more than a billion lives throughout the world, and we are committed to taking care of them. That’s why we’re dedicated to reducing our environmental impacts across all aspects of our operations – striving for performance that does not merely comply with regulations, but protects and nurtures the planet’s beauty and resources for future generations. At Johnson & Johnson we view sustainability as more than an environmental concept—it is a mindset, a responsibility, and a moral compass. In our commitment to contributing to a healthy future for all of us, we’ve set long-term environmental goals since 1990. We work to quantifiably reduce our carbon footprint, our water use, and our waste output. We source paper and product packaging derived from certified forests or made from recycled materials, and eliminate PVC from packaging. And we constantly work to improve the environmental profile of all our products, as well as the environmental literacy of all of our employees. You can view our Healthy Future 2015 Goals here. To improve product sustainability globally, we launched the EARTHWARDS program, the Johnson & Johnson Family of Companies’ greener product development process. This program helps our teams uncover areas to make our products greener, whether in terms of materials/ingredients, energy, water usage, waste, packaging, environmental innovation or social responsibility.